This entry was posted in Athletics, Baseball, Howard Terminal, News, Oakland. Bookmark the permalink. Classic Marine Layer write up. Love it. Finally! We have something we can all actually talk about! Amazing analysis ML as always! I’m really glad you got your hands on some high res images, the details are made much clearer. Also I didn’t know the Oracle dawned the original nickname of “jewel box”. I’ve always said that arena never gets the respect it deserves for its architecture. It has its flaws but it was truly ahead of its time. When I first heard of these renders, like probably all of you, I immediately stopped what I was doing to look at them. I’ve waited well over a decade to see real ballpark renderings for HT, I’ve literally have had dreams about this. So when I saw them my first reaction was it was different than what I was expecting. However the more I look at them, the more I love it. A few things that Im curious about are is not having true walls around the stadium really a good idea? I feel like glass would be better, providing a nice transparent look. Having nothing at all may come across as looking unfinished. I’m not a fan of Levi’s stadiums exterior open face looking design, it looks uninspiring and lazy to me. But much like Oracle, I think a glass exterior could solve that for this HT design. My other thought was safety for the roof park. I love that concept but the “Hobbit” slopes look a little steep? Are people able to roam freely on them or are they subject to only the top, flat, part? The other thing I noticed was what looks like a pool of some sort located in one of the renderings by the cranes. What exactly is that? If it is a pool that doesn’t seem fitting for that environment. Anyway I LOVE what I’m seeing. I still won’t be satisfied until shovels hit dirt but I feel way more confident about this plan more that any other one. Good point about the open face apse to glass, it dose fell sort of unfinished like a triple A park. I hope they do use class, not only for that reason, but it seems like it would be another buffer against any wind. And, as always ML thanks. I appreciate the detailed nature of your questions. I owe everyone here an apology. I promised ML I would return to my internship and publish a piece on the Howard Terminal/Coliseum open house. I got waylaid with real life and my day job. I like the plan. It shows creativity and a unique design, which I think is appropriate for this site. Had the Peralta site worked out, I think a more traditional architectural concept would have been preferable, but in this location, on the waterfront, they needed to come up with a forward-looking and different design, which they did. Yet the “jewel box” layout still harkens back to the Old Shibe Park. And, importantly, they are not in any way copying AT&T! While there are more details to be worked out and questions to be answered, that’s what the EIR will do. As an Oakland ballpark supporter on this site from way back, I and other Oakland proponents have endured a lot of negativity about Oakland’s ability to build a ballpark. They still have a long way to go, with many opportunities for this to get derailed, but this is encouraging, and I am optimistic. I’m looking forward to hearing about the details as they unfold in the next year. Agree 1000000% on the “nothing like AT&T” aspect of the park. I really hope they rethink the lego/ikea pyramid style buildings around the park. The stadium itself is just fine. As a huge fan of the Oakland A’s for 4 decades, I will support a ballpark anywhere in the Bay Area built with private funds. The design is the least of my concerns, though as a dude with an MBA I also worried mightily that the plan was going to be something that looked like AT&T and that would have been a long term disaster. 1. The Coliseum side of the proposal (as ML and I have pointed out for years the A’s will need a huge swath of land to redevelop/flip to other developers at a profit in order to pay for the stadium itself), that proposal seems shaky and if it is attacked by Oakland Council insurgents it could bring down the whole house of cards. This is not new and was a challenge for Peralta as well. 2. State Agency approval and required Legislation to make the site entitleable for the type of development proposed, which is prohibited on the site as of now (covenant entered into in 2004). This is pretty straight forward, there are more than 30 State Agencies that have to sign off. I would temper enthusiasm for a 2023 opening because of this factor. 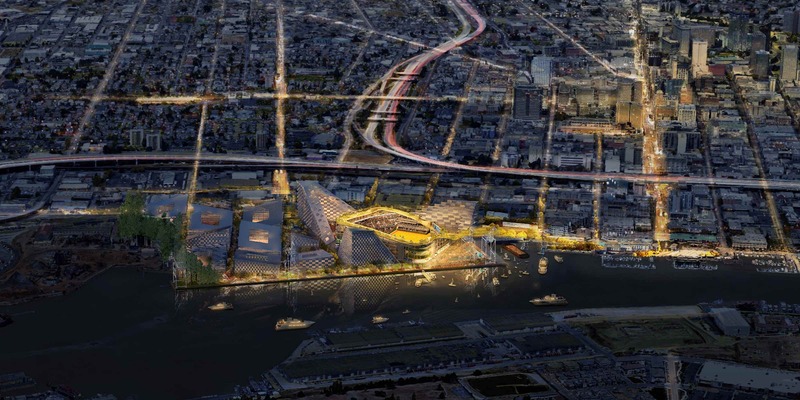 It could derail the whole thing, but more likely it will make the whole process take longer (this is why the A’s didn’t “pick” Howard Terminal until they literally had no other choice in the downtownish area). 3. Schnitzer Steel and Local Neighborhood Opposition. Despite all the reach out and community engagement, there are still residents in the area that don’t want what a ballpark will bring and there are tenants of the Port that do not want a park there. These folks will either need to be steamrolled by Oakland City Officials or assuaged in some other way. It’s exciting to see some new news about the ballpark. Much of the discussion surrounding the news has been, “How we going to get there?” After doing a little searching I found the link below about the creation of a new BART line and a multimodal station. Has anyone else seen this and what are your thoughts about its feasibility? Bill, I have seen this, and I believe the possibility of a BART extension in this location was discussed here in the past. 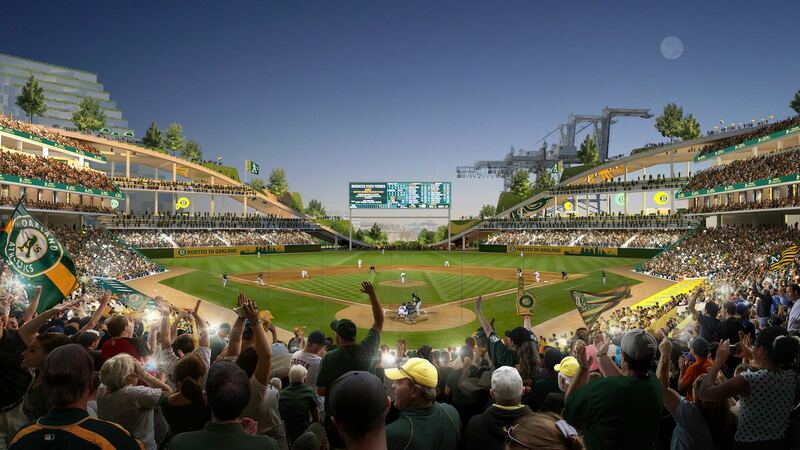 I think it’s an interesting idea and would help both the ballpark and JLS as well as Alameda. But it would be complicated to design into the BART system and would be years in the future if they ever decide to do it, not to mention the huge cost. BART is currently in the planning phase of a second transbay tube. The target I have heard, from folks who have seen the pitch, is to be approved and entitled and ready to move by 2030. Have you heard if they are considering different routes? For example would they consider extending 12th street to JLS, then to Alameda and on to somewhere in South San Francisco, or the peninsula? That would be a transbay tube connecting the southern end, which could eventually meat up with existing lines. Is that too hopeful, too costly, too fanciful, or a combination of all three? Routes are still up to debate by actual planners but heading out through JLS, Alameda and then somewhere South of Market (Probably near where the Warriors new arena is because there are plenty of businesses that folks commute to down that way) seems to make sense. I would think you’d have a new line that had end points at 12th Street (really, it’d be out to Antioch , but the existing station it terminated to would be 12th Street) and 16th and Mission, with stations in between at JLS, Alameda (probably 2), Mission Bay and maybe somewhere else in between Mission Bay and 16th/Mission. Wow, I never thought about a line coming across the Bay that would have direct access to the Warriors new arena (or close enough), as a Warriors and A’s fan that would be wonderful. That’s also something that would probably require both organization’s full political influence. Well, really it would be terminating where the UCSF Medical campus is, several tech companies (including Uber and Dropbox’s new Corporate HQs adjacent to the Warriors Arena), AT&T Park and a lot of recent residential development. SF’s downtown has been extending southlike since 1990. I didn’t realize so much was happening in that area, if the A’s (sooner but stil a while) and the Warriors (much later), can take advantage of all the other reasons BART should take that route for a new transbay crossing, that would be great. I mean, I have read this 27 times now… when is part 2?!?!?!?!?!?!?! Thinking the same thing & hoping ML is OK health-wide. No way would Jeffrey give him a good natured jab about putting more material out, if he didn’t know he was okay. So, ML part 2? Please.